Almost any interest group and almost any method of sharing has a social network. Deciding which ones to try out for your blog depends on what you want to get out of the social networking. LibraryThing: A great website that allows you to tell others about the books that you’re reading. You can catalog your collection and find information about your books by using a variety of libraries, such as Amazon.com or the Library of Congress. The tie-in with your blog? Widgets let you share what you’re reading and have read with your blog visitors. Goodreads: Goodreads is another social book-cataloging website that allows you to build virtual bookshelves of books that you’ve read or want to read. You can recommend books to others, compare what you’re reading with others in the forums, and even run a book club. And, of course, there are widgets for your blog. 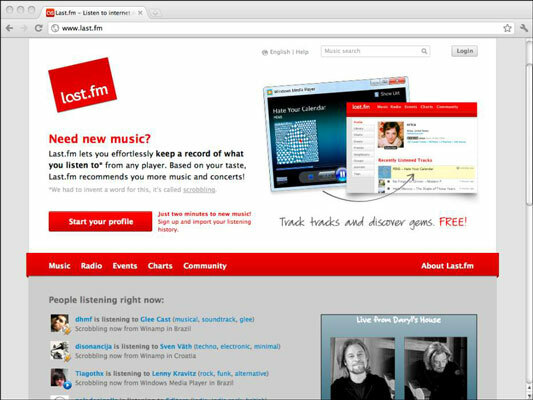 Last.fm: Founded in 2002, Last.fm is a social-networking site that allows you to share your musical tastes. You can track the music you’re listening to and share what types of music you enjoy with others. If you install Last.fm’s audioscrobbling widget, it records automatically whatever music you play on your computer, phone, or MP3 player. It then posts this information on your profile on the website. Over time, you can see what music you listen to most often, and then the website and the community can make suggestions about what other music you may want to check out. You can tie Last.fm widgets to your blog so that your readers can subscribe to your music playlist and also be your listeners. Blip.fm: Blip.fm is another, and more recent, addition to the music social-networking realm. This tool is tied closely to Twitter, so users of the one social network get the benefit of the other. Blip.fm allows you to sign up, identify your friends, search the web for music that you want to recommend (or just listen to), and then build a playlist based on the results. Do you have a friend who has impeccable musical taste? Get him or her signed up for Blip.fm, and then listen to his or her playlist. You can even link your Last.fm account to Blip.fm and let your computer do all the work of blipping songs for you. Ravelry: Ravelry is a social network designed for knitters to share information about what they’re making or thinking of making, how they did it, and other such conversation. You can add friends and send messages, and of course, if you have a knitting blog, you can pull your blog posts into Ravelry and get your friends from Ravelry over to your blog. Initially, social bookmarking was just an online service that allowed you to save all your bookmarks without worrying about whether you’d lose them. As social networking became more popular, social-bookmarking websites got into the act and began to offer all kinds of ways by which you can share your bookmarks with others or discover new and interesting websites to visit. Delicious: Early on in the life of the web, someone realized that we all spent a lot of time e-mailing each other links (“You have to see this; it’s hilarious!”) and that a more efficient way to share that kind of information probably existed. Enter Delicious. 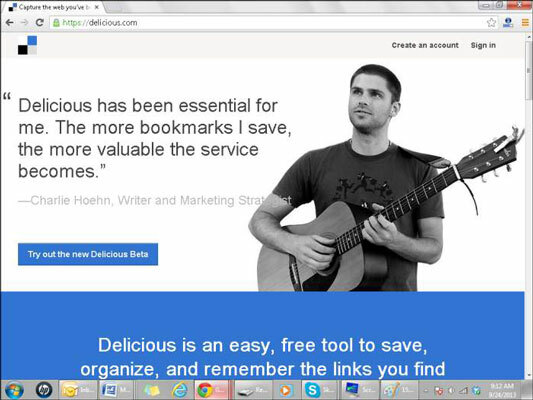 Delicious enables you to record and tag links for later retrieval. You no longer have to be at the same computer to remember what websites you’ve visited or bookmarked. You can make your bookmarks private or share them with the public. You can also share your bookmarks by using the built-in RSS feeds and by sharing your bookmarks with your personal network of other users. StumbleUpon: Many people have called StumbleUpon one of the biggest time wasters online today. But that isn’t actually a bad thing. web surfing is a time-honored way of negotiating the World Wide web; and StumbleUpon simply acknowledges that fact and then gives you some outstanding tools for more efficiently and intelligently surfing. With StumbleUpon, users post and recommend interesting things that they find on the web, and others view those recommendations and add their own endorsements, effectively creating a snapshot of the most interesting and compelling links on the web. You can imagine how useful sharing becomes when you create a community on StumbleUpon of your friends and colleagues; if you combine their recommendations with the personalization options that StumbleUpon provides, it’s like reading a personalized (albeit somewhat eccentric) newspaper. A bunch of networks allow you to post your location on a map or track your (and your friends’) geographic whereabouts. Typically, these kinds of social-networking applications need a little forethought before you use them. Do you really want your colleagues to know where you are at all times? But these kinds of programs can help you create impromptu coffee meetings or figure out whether someone you want to see is “checked in” nearby. Many location-based networks also give you information based your current location for nearby great places to eat, shop, or visit. These services are really designed for mobile phone users who have signed up for data plans. One network to try is foursquare, which allows you to use your phone as a GPS device. It tracks your location, checks you in at the places you visit, and awards points for everywhere you go. If you’re the most frequent visitor to a location in a 30-day period, foursquare declares you the mayor of that location, and you can even earn badges.